Amid reports that some Congress legislators and leaders were unwilling to give up use of red beacons on official vehicles, Punjab Chief Minister Amarinder Singh on Saturday urged them to shed VIP culture and voluntarily give up the privilege. The Congress leaders in Punjab should set an example in line with their commitment to the state's people as part of the Congress election manifesto, he said in a statement here. "It is the collective responsibility of all Congress members to uphold the commitment. . . , " Amarinder said. The Chief Minister assured the Congress leaders that "abandoning the VIP culture will not lead to erosion of their respect and authority but actually raise their esteem in the people's eyes". "If red beacons could raise a leader's status and ensure his or her popularity, then no government, MP or MLA would ever lose an election, " he said, adding that the red beacon is a regressive symbol that should have no place in a progressive society. On March 18, the Punjab Cabinet decided not to use red beacons by the Chief Minister, ministers and senior government officers in the state. The Chief Minister lauded his ministerial colleagues and party MLAs who had already removed red beacons and won accolades from the media and the general public for arriving for the assembly session on Friday in Chandigarh in cars without beacons. "The people voted us to power as they trusted us to keep our promises and had faith in our ability to deliver on all counts. Shedding VIP culture is a very small step in the direction of meeting their expectations, " Amarinder said, adding that the shift required a major mindset change. 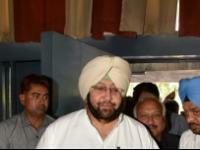 Amarinder said he was confident his party colleagues will take this step in the interest of the state and people who, he added, see the VIP culture as a culture of alienation and isolation.